Amongst the myths of the Pilgrims is the ideal that they were peaceful folks who never quarreled with anyone and never feared an attack because they were friends with the natives tribes. Furthermore, they lived in their own little bubble of safety, immune from the dangers of the outside world. Let’s do some myth busting! We already discovered that two ships originally left England and that the Pilgrims knew how to do more than pray and eat. Today we explore the reality of the Pilgrim’s world and how the men were prepared to defend their families from assault. 1559-1648 – War in the Netherlands. This religious and politically sparked war lasted 89 years, but there was a period of truce. Interestingly, that truce was between 1609-1621, which was the exact period when the Separatists (Pilgrims) sought religious refuge in that country. 1588 – Spanish Armada. As part of an on-going struggle with religious roots between Spain and England, a large convoy of Spanish warships set out to invade the island nation. However, fireships and fierce storms prevented any successful landing, leaving Britain free to continue supporting Protestantism and semi-political freedom. 1588 -1590 – The War of the Three Henrys. Religious conflict plagued France as Catholics and Huguenots struggled to tolerate each other. The War of the Three Henrys erupted when three men (all named Henry, in case you hadn’t guessed) claimed the French Throne. In the end, Henry of Navarre triumphed and issued the Edict of Nantes, allowing a period of religious freedom in France. 1618-1648 – The Thirty Years War. Beginning with a religious conflict, this war dragged through the decades and involved many nations of Europe. It is generally acknowledged that there were four periods of the war: The Bohemian Conflict, The Danish Conflict, The Swedish Intervention, and The French Intervention. The war ended with the Treaty of Westphalia in 1648 (an event which is usually the end of Western Civ. 1 classes in college). From 1620-1622 Plymouth Colony did not have a fort for defense. The settlers were busy just trying to survive, and, since they had established peaceful relations with the local native tribe, they had no real reason to build a fortress. It should be acknowledged that before the Peace Treaty in spring of 1621 the Pilgrims were afraid of attacks from the tribesmen, especially because they had had some strange encounters during the early exploring in December 1620. When the men were searching for the right location for the settlement, they went out in their armor and carrying their weapons. Now, in 1622 – the year after the First Thanksgiving – a warning message from an unfriendly tribe and rumors of a massacre in Virginia, prompted the Pilgrims to build a stockade around their town, post sentries, and have the men form several militia units. In the following years, Plymouth was never directly attacked, but their militia aided other settlements and also acted as a “police force” to help keep the peace. 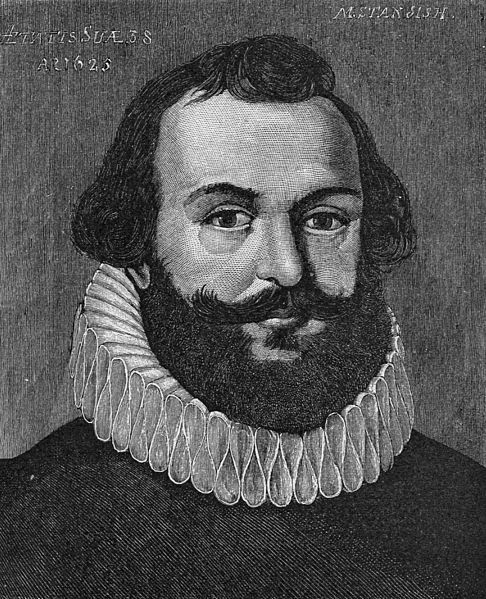 An artist’s image of Captain Myles Standish. It is not confirmed if the image is based on a real painting from the 1600’s. Meet Myles Standish, the military leader of Plymouth colony. While much of Captain Standish’s life prior to 1620 is mysterious, we know that he did have a military background. It is very possible that he led English soldiers during the War in the Netherlands. By 1620, Myles Standish was married, highly educated, and respected in military matters. Captain and Mrs. Standish were “strangers” – they were not going to America to escape religious persecution. Once in the New World, Captain Standish led the exploring groups and probably directed his comrades toward choosing a town site on elevated, defensible ground. During the winter, Mrs. Standish died and the captain was one of only two Pilgrims who did not get sick. When the Wampanoag tribesmen assembled with the Pilgrims to sign the peace treaty, Captain Standish also made sure he suitable impressed everyone with his little militia and his cannon. In later years, Captain Standish led the Plymouth militia to defend other settlements from attacks and represented the colony on business trips to England. His military skill proved essential to the success of the colony and his leadership abilities made him a trusted resident of Plymouth. So what did the Plymouth militia use for weaponry? What type of armor did they wear? The armor of the early 1600’s was fairly useless and even dangerous on the European battlefields. (Bullets were penetrating the armor and then bouncing of the back-pieces and sides – think of a marble inside a tin can and you’ll have the unhappy idea.) However, armor was useful in the New World as protection against arrows and hatchets. 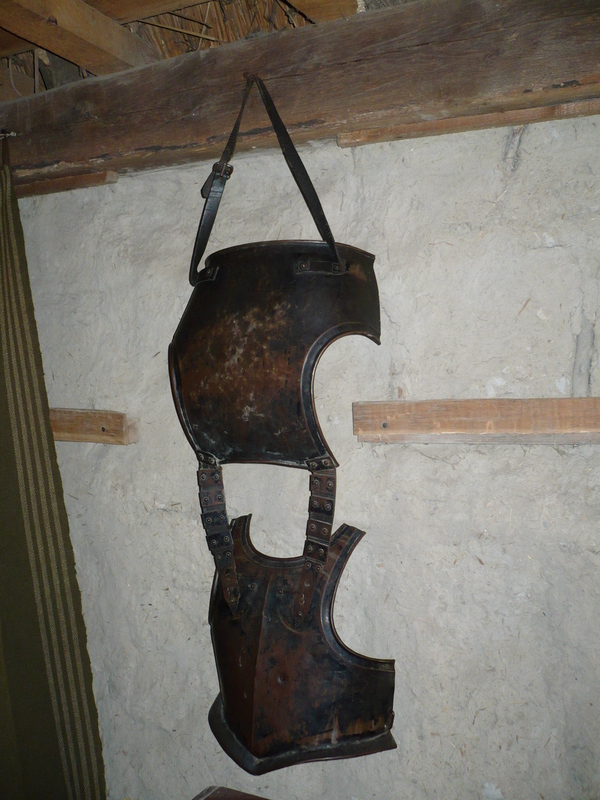 Many of the Pilgrim men had breastplates and helmets which they would’ve worn for their military demonstrations, when they stood sentry, and when they defended other settlements. Swords were a symbol of status in this era. We know that Myles Standish carried a special sword that he had obtained somewhere in his European travels. Daggers were common. But don’t get the idea that the Pilgrims had them up their sleeves, ready to murder each other; that’s inaccurate! A dagger was like a pocket knife back then, and men carried them to assist in day-to-day tasks. By the 1600’s, cannon were in wide-spread use on European battlefields, though they still lacked range and directed effectiveness. 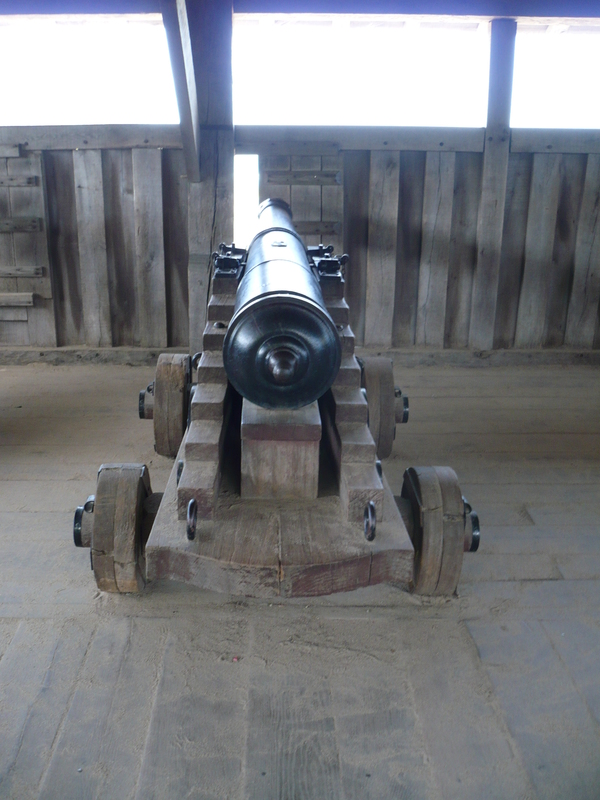 The Pilgrims did have cannons at Plymouth, and those weapons were a source of intimidation to unfriendly native tribes. The Pilgrims did not come to America as conquistadors. They came willing to work and build a new settlement, but they knew they might have to defend themselves. Thus, under the leadership of Captain Myles Standish, the Pilgrim men prepared to protect their families and new homes if necessary. Wars and weaponry were not foreign concepts to the Pilgrims. Europe was filled with conflict and these people knew (and possibly experienced) that first-hand. By coming to the New World, the Pilgrims left the religious and political wars behind, but they understood the importance of a militaristic presence to ensure their own safety. P.S. Had you ever considered the armor, weapons, and defense strategies the Pilgrims used? What lessons might we learn that are applicable to the our lives in the 21st Century?